Considering most TV-to-film adaptations are generally commercial failures, Brian De Palma’s 1996 update of Mission: Impossible is truly a diamond in the rough. The original installment of the Mission: Impossible series was the third highest-grossing film of 1996 and spawned four sequels. Not bad for a remake of what used to be the longest-running espionage TV series (before 24, of course). 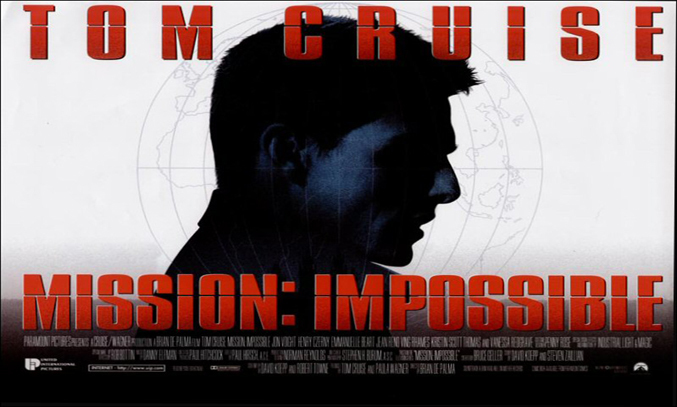 Mission: Impossible (also known as M:I) follows IMF agent Ethan Hunt (Tom Cruise) who is framed for the murder of his fellow agents and falsely branded a traitor following a botched operation in Prague. Desperate to uncover the mole who has framed him and killed his mentor Jim Phelps (Jon Voight), Hunt embarks on a daring scheme to clear his name. What makes the original Mission: Impossible film so special is it is prominently plot-driven rather than action-driven. Unlike its sequels, Mission: Impossible relies on a complex web of character relations, conceits and deceits to propel the story forward, making the plot both intriguing and convoluted at times. That said, there are plenty of spectacular high action scenes to keep you entertained, including the film’s most famous scene in which Hunt hangs 30 feet from a ceiling to retrieve a disk from a well-alarmed room in CIA headquarters. Unsurprisingly, Mission: Impossible was a critical and commercial success, spawning five sequels and becoming the 20th highest grossing film series of all time with over $2 billion worth of worldwide gross.